CHARLESTON, S.C. (December 13, 2017) – One of the primary goals of the International African American Museum (IAAM) is to illuminate African American history, and in the process, elevate diversity and inclusion, a mission shared by BB&T. With this in mind, the IAAM reached out to the bank earlier this year to explore a relationship. Today, the IAAM is thrilled to announce a $250,000 pledge from BB&T, which pushes the museum even closer to its Founders Fund finish line. “It is a great honor to receive this leadership investment from an institution that has been serving our country for nearly 150 years, and which so closely aligns with our organization’s foundational values,” said Michael Boulware Moore, the president and CEO of the IAAM. BB&T’s core values, based on happiness (self-esteem and pride), success (productivity, teamwork, justice), judgment (reality, reason, independent thinking) and character (honesty, integrity), will be the same driving tenets of the museum. Happiness (Self-Esteem and Pride): The museum will not only remember those who disembarked at Charleston’s harbor, it will celebrate the countless contributions of African Americans and their ancestors. It will shine a spotlight on leaders, visionaries and changemakers who left indelible marks on America’s history, traditions and culture. The IAAM hopes that this celebration of African American history will help strengthen the pride and self-esteem of each and every one of its visitors. Success (Productivity, Teamwork, Justice): Nearly half of all enslaved Africans forced to North America entered the country in Charleston, and the majority of those men, women and children disembarked at Gadsden’s Wharf, the site of the forthcoming IAAM. The millions of African Americans who can trace their lineage back to this city deserve a place that commemorates their ancestors and that helps them identify their relatives and find their roots. The IAAM will be that place. In the Center for Family History, teams of researchers will work together to help visitors travel back in time to find family members and countries of origin that have long remained elusive. The museum will detail the African American experience as it relates to the Story of America, providing the full and unvarnished truth for its visitors, who can feel a sense of justice knowing that history has been accurately and completely presented. Judgement (Reality, Reason, Independent Thinking): The IAAM will be a living institution that is constantly evolving and promoting action. The museum will serve as a platform to foster dialogue about race relations and current issues, and hopefully, as a place to forge pragmatic solutions to the challenges we face. 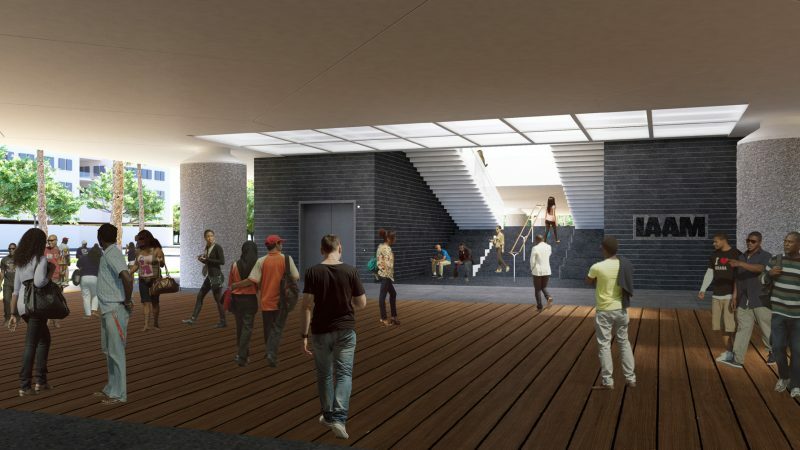 To accomplish this, the IAAM will leverage multimedia elements, designed by Ralph Appelbaum and his team. These digital elements, dispersed throughout the museum, will be interactive, allowing visitors to explore and encouraging independent thinking. They can also be populated with different images or videos to introduce current events from the news to spark discussion. Character (Honesty, Integrity): One of the core functions of the IAAM will be to present a comprehensive look at African American history. To enhance and spread that message, the IAAM will develop corresponding curricula that will be available throughout the state and across the nation. These curricula will provide teachers with the resources they need to teach students of all ages about the African American experience. Taking an honest look at our collective past is essential to strengthening the American Character, which we need to encourage now more than ever. BB&T is one of the largest financial services holding companies in the U.S. with $220.3 billion in assets and market capitalization of $37.0 billion as of September 30, 2017. Building on a long tradition of excellence in community banking, BB&T offers a wide range of financial services including retail and commercial banking, investments, insurance, wealth management, asset management, mortgage, corporate banking, capital markets and specialized lending. Based in Winston-Salem, N.C., BB&T operates over 2,100 financial centers in 15 states and Washington, D.C. A Fortune 500 company, BB&T is consistently recognized for outstanding client service by Greenwich Associates for small business and middle market banking. More information about BB&T and its full line of products and services is available at BBT.com.